In today’s world where the majority of the populations have access to the Internet, computers, and smartphones, the use of social media has become mandatory, especially for marketers and merchants operating online. This holds true for the Bitcoin gambling websites. The Bitcoin gambling niche in its early days significantly changed. Within only a few years, it now houses more than 100 betting platforms that cater to different markets, be they casino, poker, sports betting, dice, or lottery for instance. The rise of this sector also increases the competition within the industry, and this is where social media use plays an integral role. Real-money online casinos use Facebook to promote their brand, but it appears that the Bitcoin casinos are more effective and active in using this social network to highlight their presence on the market. As compared to the traditional gambling websites, Bitcoin casinos have the stronger need to build a community of players, and Facebook is definitely the best medium to achieve this goal. Creating a Facebook page dedicated for the casino helps expand the brand reach, thereby tapping more potential customers without spending larger amounts. It also generates more traffic and sales, as well as become a venue to foster partnerships among users, operators, and other business players. 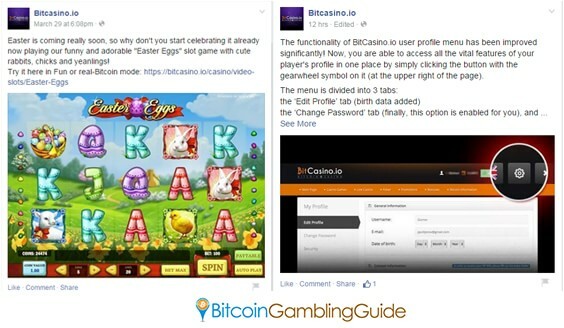 Moreover, Bitcoin casinos wholly operate on the web; thus, their target market is likely to be a Facebook user. Take for instance some of the most popular names on the market like BitCasino.io and BetChain Casino. Powered by Coingaming.io, BitCasino.io has emerged as one of the largest Bitcoin casinos online, with more than hundreds of games in its library and an array of features offered. Taking a look at its Facebook page, it becomes evident that it regularly posts quality content. These are not just any kind of posts, though. Instead, they are announcements promoting their featured games and even new features. Moreover, they are complete with screenshots. Other than the content, using the cover image is an excellent technique to maximize the functionality Facebook brings to online companies. BetChain Casino appears to be aware of this strategy as it wisely placed a photo of its bonus promotion as its cover image. This casino running on the SoftSwiss technology offers a Welcome Bonus of 110 percent, and this is what users will instantly see upon visiting its Facebook page. To further magnify the power of Facebook, even new gambling websites use it as a tool to introduce itself to the world. VitalBet is the perfect example of this. 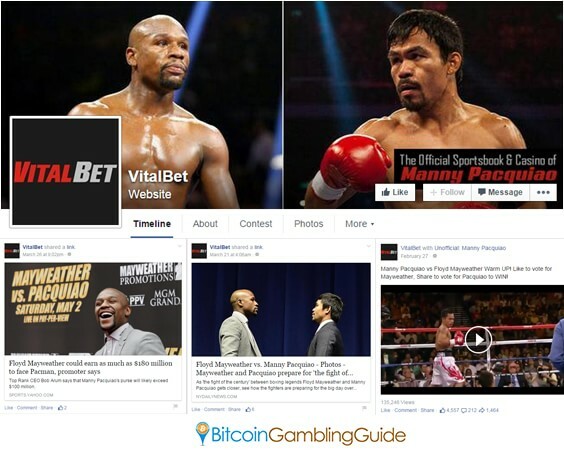 A Bitcoin sportsbook marketed to be owned by eight-division world champion Manny Pacquiao, VitalBet uses its Facebook page to hype the highly anticipated match between Pacquiao and Floyd Mayweather. From the cover image up to the regular posts, this Bitcoin sports betting site strategically promotes its platform powered by Ultraplay as the go-to site for Bitcoin bettors eager to wager on this boxing match. Boosting the market of Bitcoin gambling on Facebook is a guarantee, but there are other social platforms that can also be utilized to achieve the same goal. 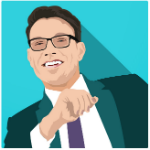 Twitter, Google Plus, and other kinds of forums like Bitcointalk.org are great alternatives or support on top of the top social network today. With effective use of the social media, it becomes clear then how the Bitcoin casino market boomed in the past few years. And it is, in part, with the help of Facebook.